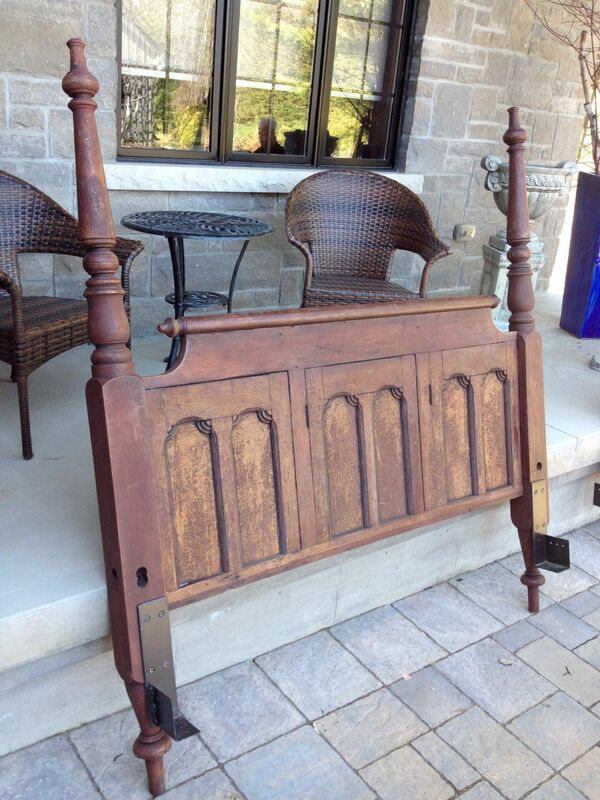 Anyone familiar with antiques knows that there are no old queen size beds. They just didn’t make them. People slept differently in those days, partly sitting up; and they must have valued floor space because most century old beds are no wider than a contemporary ¾ size, and are shorter by a couple of inches. Not that comfortable by contemporary sleeping standards. How many of us have struggled through a night in a friends guest 1840 rope bed, which when you attempt to get in sinks by inches and caves towards the middle because the ropes are loosening. Aesthetically beautiful as the bed may be, it doesn’t make up for a sore back. So what is an antique lover to do if they want to provide a comfortable queen size bed for their guests, but also want that bed to fit in and sympathize with an otherwise antique setting? Some people will buy a good looking reproduction, some will modify an old bed which lends itself to being enlarged; or in the case of friends and collectors Paul and Cindy Beischlag, they saw the potential for an interesting head and foot board in a set of old cupboard fronts, and went on to design and make their own. It started when they bought an old cupboard front from me. A beautiful, circa 1840, series of 6 doors framed in and hinged, saved from a long ago dismantled built in the wall cupboard. 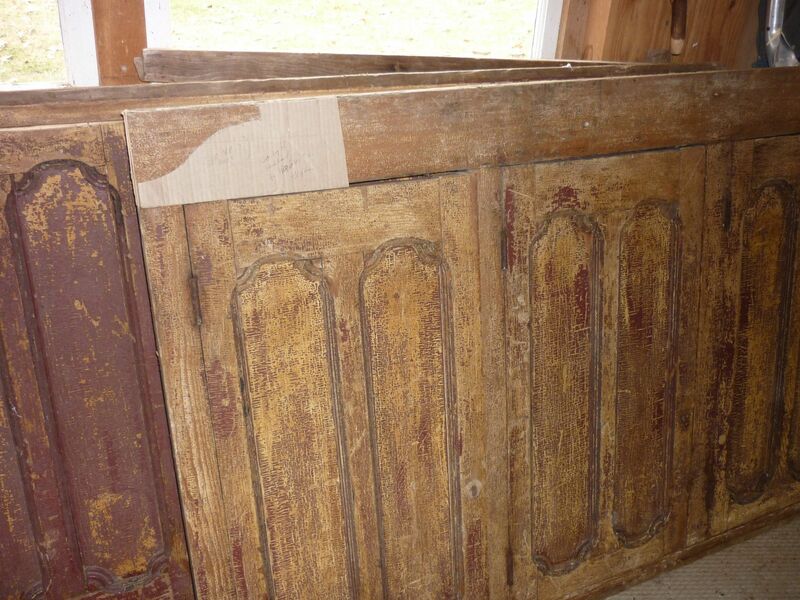 I had bought it years ago thinking I I might build a work table using them as a series of doors to storage underneath. It never happened, and so many years later Paul and Cindy spotted them at our clear out sale. They could imagine them running side by side, as is, to make up the front of the headboard. They then came up with a design by studying other old beds, and set about trying to find four posts for the corners. 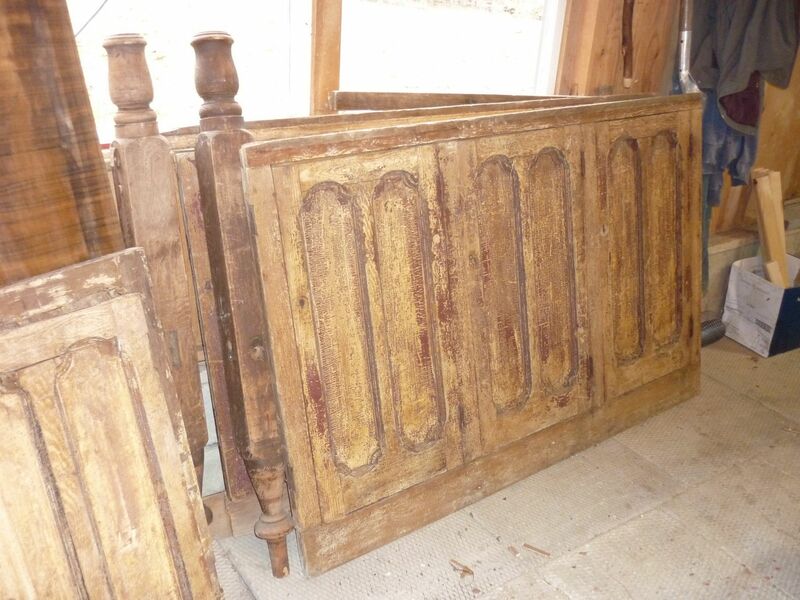 After looking far and wide they found a nice set of four from Port Hope dealer Clay Bensen, with the only problem being that years ago they had been cut off about half way up, and the original tops were lost. They liked them though and bought them, and set about trying to find something that could replace the missing top part. 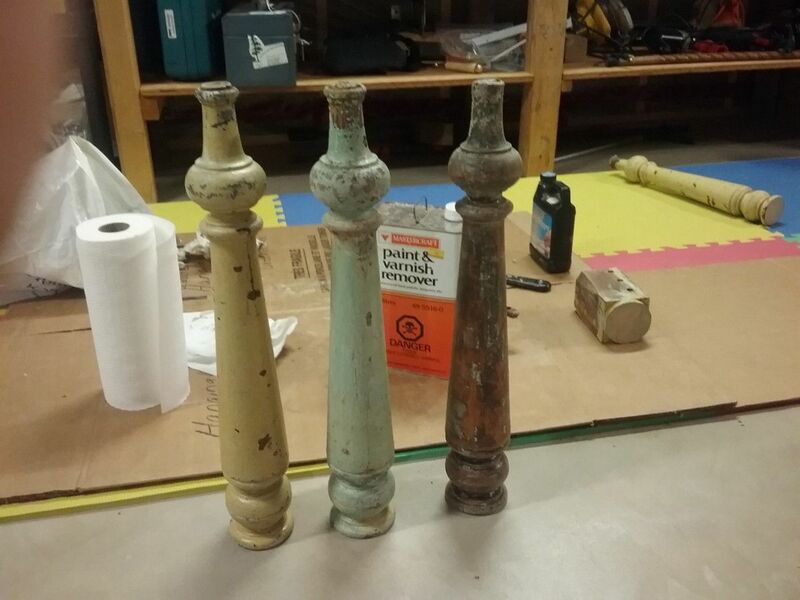 Within a short time they found four old thick table legs at another local dealer and realized that turned upside down and attached they would finish off the posts nicely. Talk about serendipity. 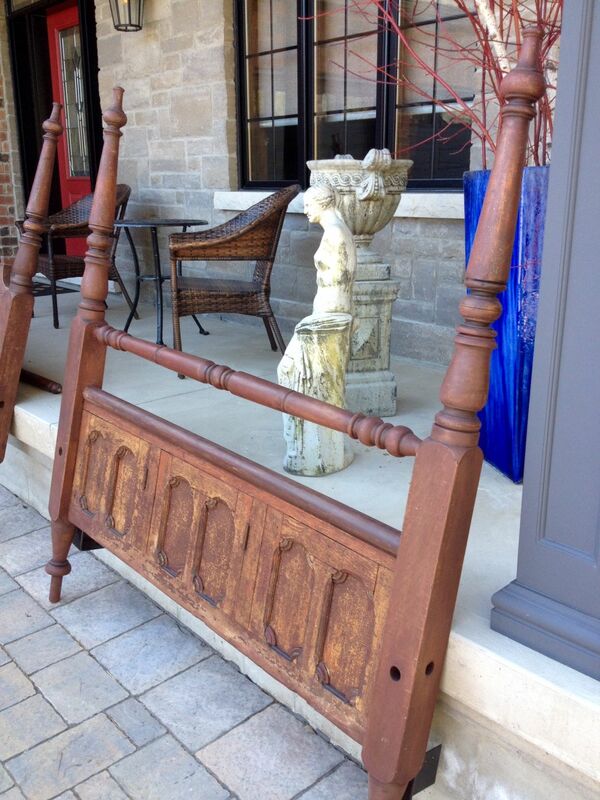 The only thing they knew that they were never likely to find was a blanket rail, and a turned top rail, so they drew out the designs for these pieces and had them turned from reclaimed timber at C.J’s antiques and restoration near Simcoe Ontario. They did a wonderful job. Scott Fletcher getting ready to match up some paint. Paul and Cindy are lucky enough to have an artistic friend named Scott Fletcher who was willing and happy to work with Paul to create this unique piece as a winter project. 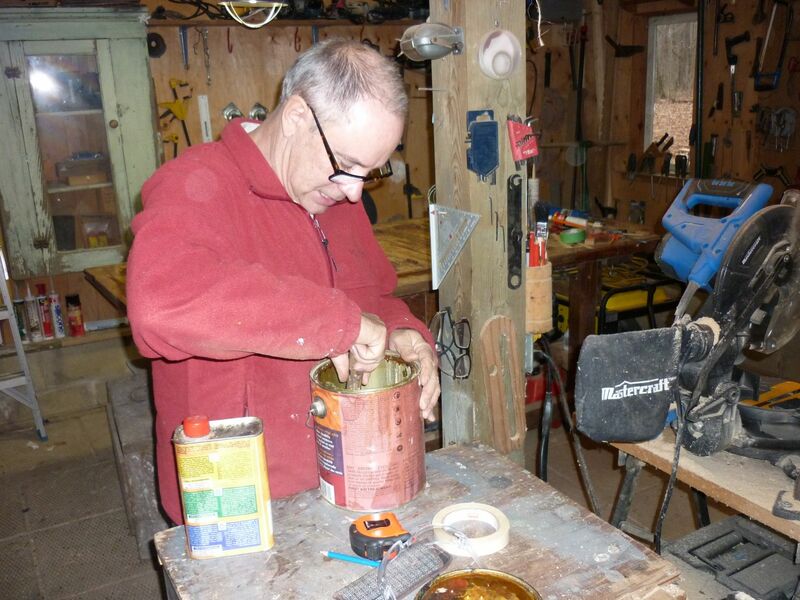 Even better, Scott has a large, fully equipped workshop. So they went into the shop, and worked on it, and worked on it, on and off for a total of about 100 hours; and what they emerged with after all that time is a unique, sympathetic, and “beautiful in it’s own right” queen size bed. They did an excellent job. Here are some photos they kindly provided me with, along with some explanations. template showing how top board was to be cut out. table legs had to have the paint stripped so they could be matched up with the posts.